In case you haven’t heard, newsletters are back (and bigger than ever). A regular email is a great way to connect with your audience in a really intimate way — and it might be the first step to turning a casual listener into a super fan. But you shouldn’t start a newsletter without thinking deeply about what you’re trying to accomplish, who you’re trying to reach and, above all, why a newsletter is the best vehicle for your goals. 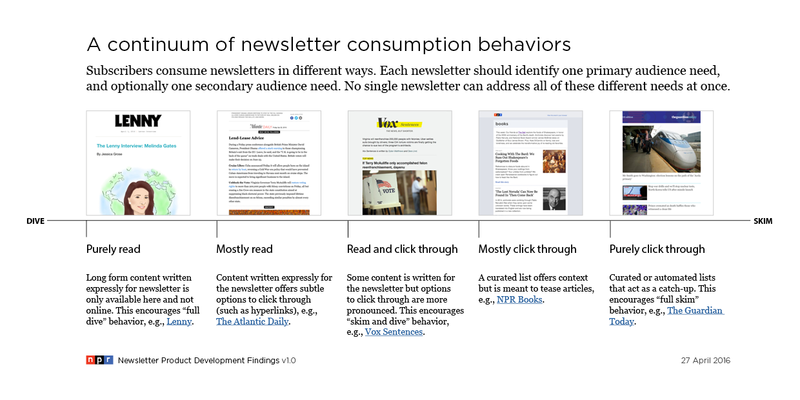 Earlier this year NPR Digital Media designers Libby Bawcombe and Veronica Erb did a comprehensive review of internal and external newsletters to figure out what works well in that space. After reviewing dozens of newsletters received over a few weeks, they found that each tended to fall on a continuum between “dive” and “skim,” as noted below. On the left side are the emails designed to be read all the way through. Like Lenny Letter, they often feature exclusive newsletter-only content. The emails on the right side serve as a click-through launchpad. (Tip: They found that the most highly engaged newsletter audiences were not the ones getting these types of emails). As a way to translate the findings into action, Lauren Bracey Scheidt, a senior product manager in NPR Digital Media, also developed a visioning exercise for newsletter creators. Who are your newsletter subscribers? What audience will this newsletter serve? Where does this audience hang out? Where do they get their news? What does this audience desire in a newsletter from us? What need in this audience will this newsletter fulfill? Where will subscribers be when they read this newsletter? Where will we recruit subscribers? Examples: @NPRPolitics Twitter account and Facebook page; invitation to Health newsletter subscribers; Monkey See blog posts. What does success look like in 3 months? Examples: Click-throughs to program page up by X%, social signups increase by X-number of users, etc. What does success look like in 6 months? Examples: Newsletter subscriptions increase by X-number of users, subscribers include influencers who work at these 3 big-deal organizations, etc. What goal will a newsletter help your desk/vertical/NPR accomplish? Who is responsible for getting this newsletter done, day after week after month? How does this fit into your team’s workflow? Note: This newsletter identity plan is also available as a Google Doc. Please note that it is a work in progress and may change — see the Google Doc for the most up-to-date version.